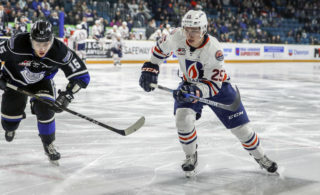 Kamloops, BC – The Kamloops Blazers have made a significant trade three days prior to the WHL trade deadline. 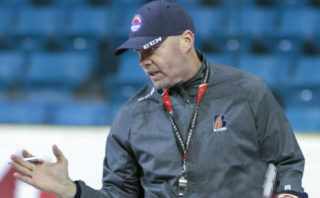 The Blazers have sent veteran 19-year-olds Garrett Pilon and Ondrej Vala to the Everett Silvertips in exchange for 17-year-old defenseman Montana Onyebuchi, 17-year-old forward Orrin Centazzo, 2002-born prospect Kalen Ukrainetz, 2002-born prospect Nathanael Hinds, a first round pick in 2019 and a fourth round pick in 2019. Onyebuchi is a 6’3” and 210lb right shot defenseman from Dugald, MB. He is in his second WHL season and has three goals, seven assists and 10 points along with 65 penalty minutes in 38 games this season. 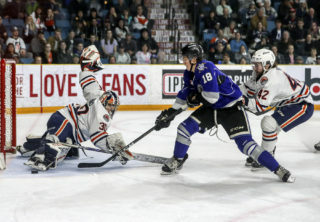 Centazzo is in his second season in the WHL. The Marwayne, AB prospect has six goals and 11 points in 40 games this season. In 81 career WHL games, the 5’8” and 160lb forward has 10 goals and 10 assists. 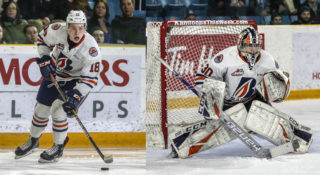 In addition to the roster players, the Blazers have also acquired 2002-born prospect forwards Kalen Ukrainetz and Nathanael Hinds. Ukrainetz is from Wynyard, SK and plays for the Tisdale Trojans of the Saskatchewan Midget AAA Hockey League. He is third on team scoring with 11 goals, 10 assists and 21 points in 29 games this season. The 5’9” and 150lb forward was a ninth round pick of the Everett Silvertips in the 2017 WHL Bantam Draft. Hinds was selected by Everett in the third round of the 2017 WHL Bantam Draft. The 5’10” and 160lb forward plays with the Winnipeg Bruins of the Manitoba Midget AAA Hockey League. He has seven goals, 15 assists and 22 points in 28 games this season. “The acquisition of Kalen and Nathanael was an important part of this deal. We thought highly of both of them during the 2017 WHL Bantam Draft. We are excited to meet the players and their families and introduce them to our program,” said MacGregor.